Dr. John and Helen Weaver Saffell, AHS '34/'40. John and Helen Weaver Saffell ‘34/’40 established a scholarship gift to benefit Alliance High School graduates in 2000. Their $52,895.00 donation was in memory of his parents, Byron E & Isabel Anderson Saffell. John Saffell followed in his father’s footsteps, as an educator, as both he and Helen served on the teaching faculty at Mount Union College. He was a member of the history department and she, a member of the English Department. Helen passed away in 2001, and John died in 2014. John continued to take an active interest in the AHS Foundation scholarship program until his death, periodically making additional gifts that increased the scholarship fund. 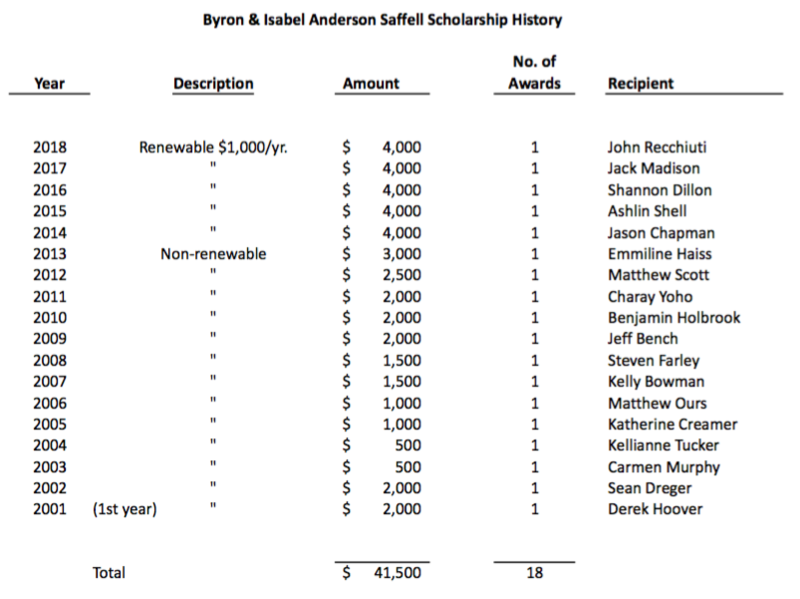 The Saffell scholarship, which is preferably directed toward a concentration in history, has been awarded every year since 2001.